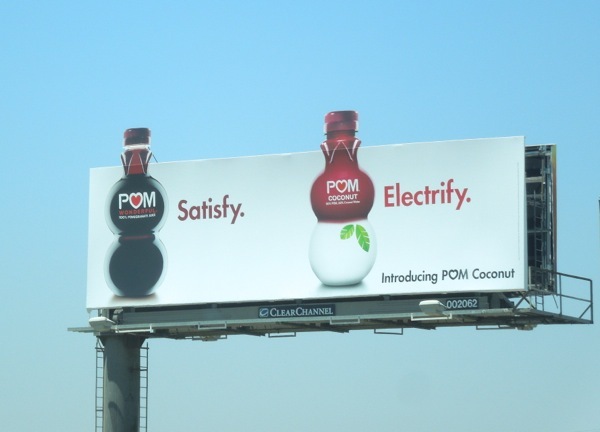 Pom Wonderful, the pomegranate juice brand, is branching out into fruitier territory with a new range of mixed juice drinks including Coconut, Mango and Pineapple variants. 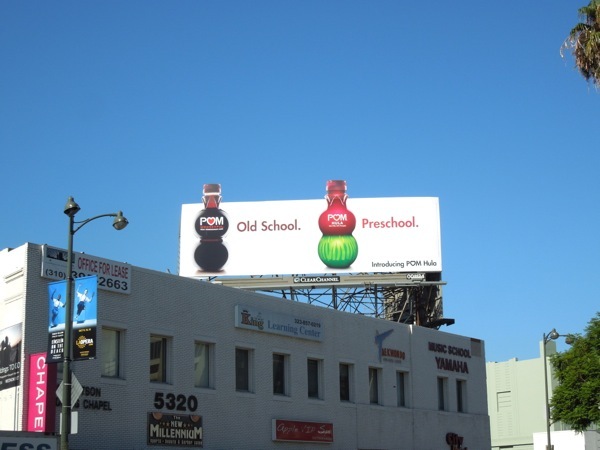 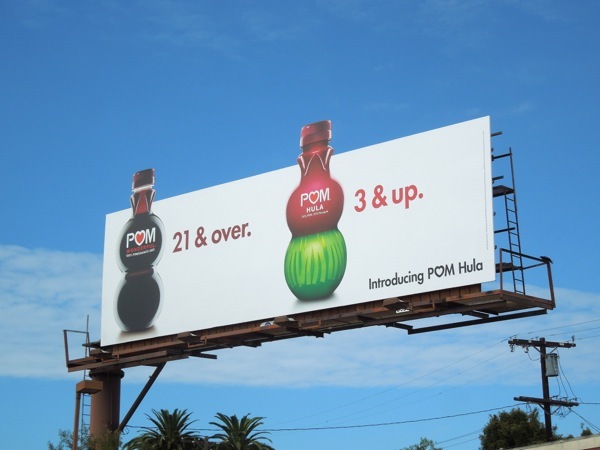 To support their fun product extensions the California grown juice brand has this eye-catching collection of special extension billboards dotting the skies of L.A. at the moment. 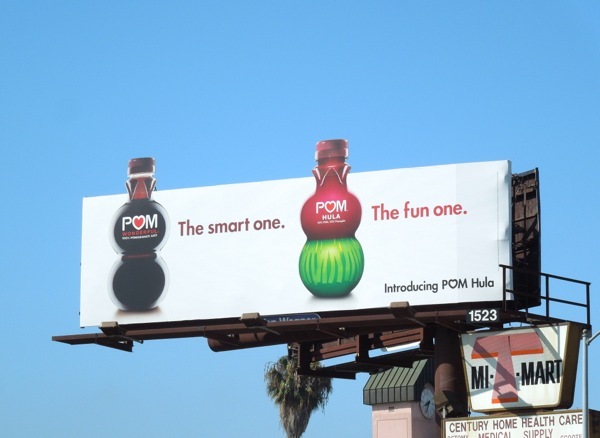 As well as some inventive packaging redesigns for their signature double-bulb bottle for the new tropical flavours, and the fun name 'Pom Hula' for their pineapple variant, the ad creatives also have some witty, tongue-in-cheek copy to compare the new drinks to the original 100% pomegranate juice. 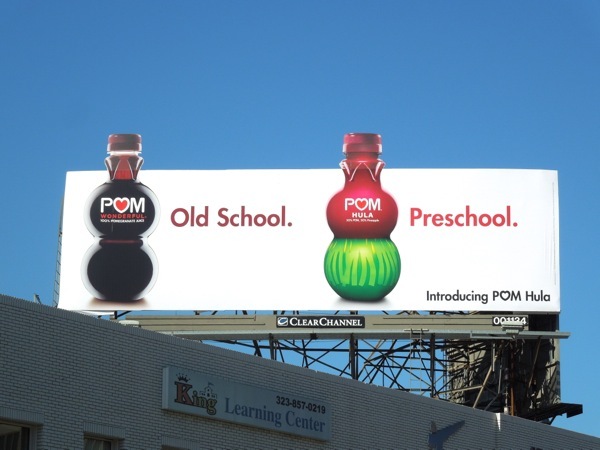 There's 'The smart one vs The fun one', 'Renew vs All-new', 'Sip vs Chug', 'Old school vs Preschool', 'Satisfy vs Electrify' and Daily Billboard's personal favorite 'Yum vs Potassi-yum'. 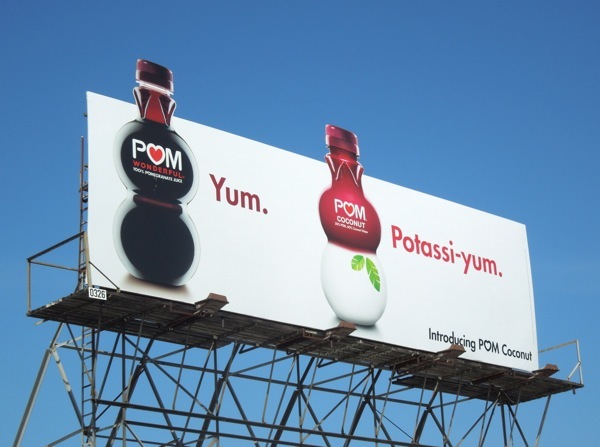 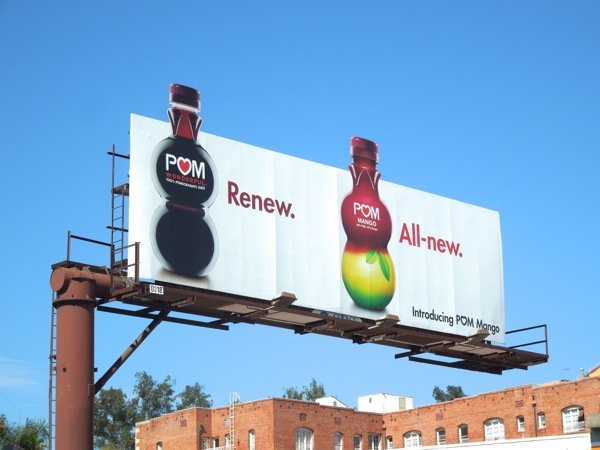 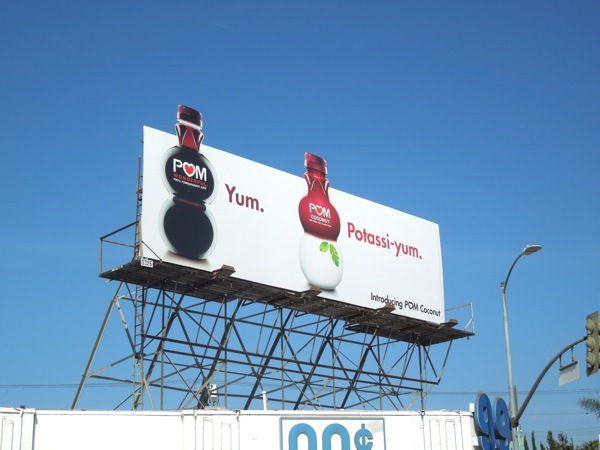 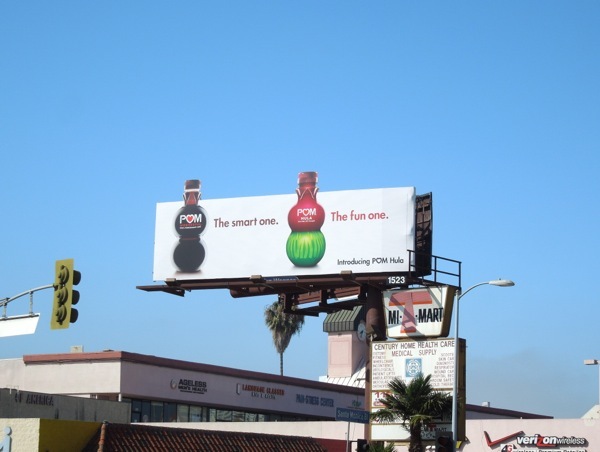 This Pom billboard ad campaign was first spied along Santa Monica Boulevard on Jul 30, and further creatives snapped along Fairfax Avenue, Cahuenga Boulevard, Wilshire Boulevard and the I-5 through to August 23, 2013. 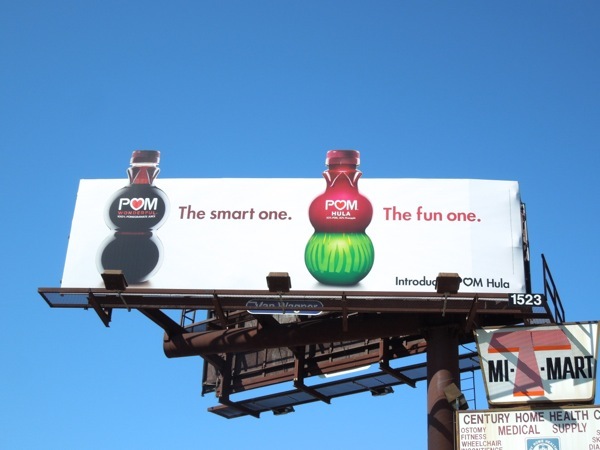 The special extensions of the bottle caps peaking over the tops of the billboards, simple design and humorous copy all help the ads stand out against all the multitude of drink brands vying for your attention and money in the city skies. 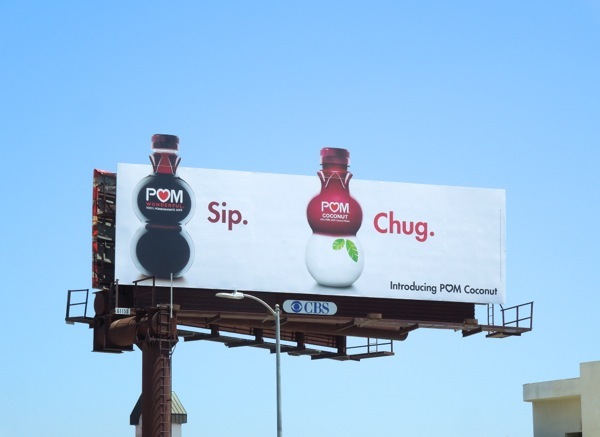 Don't forget to quench your thirst for more interesting drinks advertising campaigns, for both soft beverages and alcoholic brands, here at Daily Billboard. 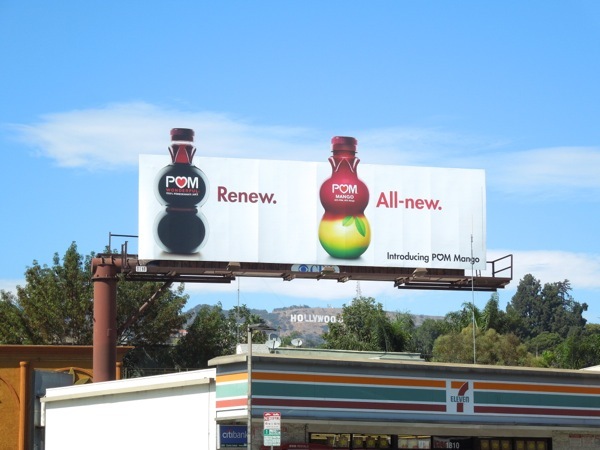 UPDATED: Pom's latest advertising campaign must have kicked into high gear as their billboards seem to be popping up everywhere around L.A. at the moment. 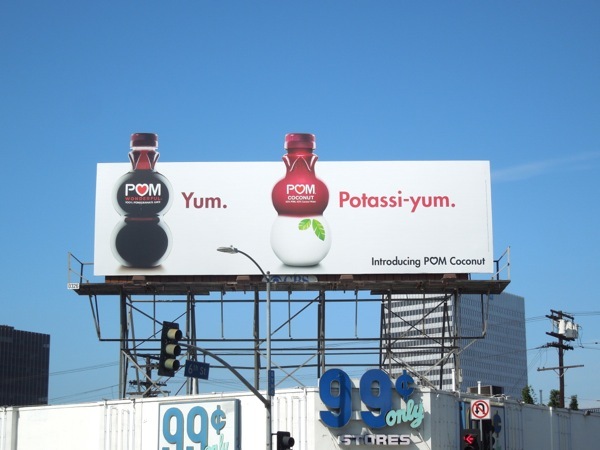 Here's another creative for Pom Mango snapped along Sunset Boulevard on September 4, plus an addition special extension ad for Pom Hula spotted at the high traffic intersection of La Cienega Boulevard and Venice Boulevard on August 31, 2013. 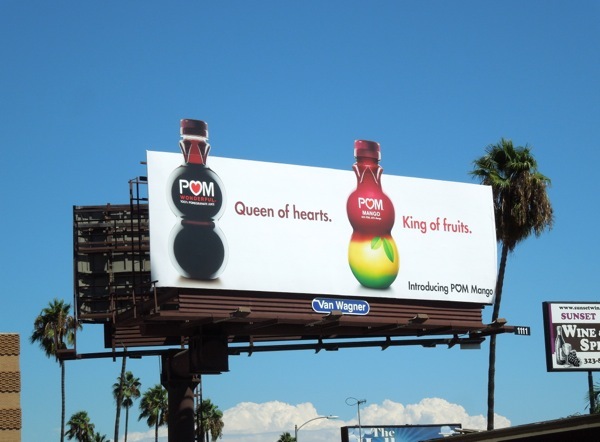 The ads continue to plug the heart-healthy benefits of the original pomegranate juice and the benefits of the new juice varieties in their kid-friendly and appealing bottles.